The programme is designed to develop and stimulate the Beavers and to give variety and interest to their activities. It is a progressive programme which allows the children to grow throughout the period between 5 and 8 years of age. It takes into account the learning your child will make and is be spread over the full, normal programme in such a way as to achieve slow progress by completing a subject each month. It eventually allows for their development prior to joining the B-P Wolf Cub Section making the transition easier for your child. A Beaver is always busy and bright, and helps other people by doing a good turn every day. And to be a good Beaver. ‘Dear Lord, help me to be a good Beaver, Always busy and bright. This is the first badge your child will attain at investiture. It is the first step in their movement through the Scout Group and is a welcome to the Association. (2) Know the: Beaver motto, Beaver Salute, The Scout Handshake. (3) Know a little about the Founder, Lord Baden-Powell and how Scouting started. (4) Take part in the opening ceremony ( the tail-slap). (5) Know the Beaver prayer. (6)Know the Beaver Law and Promise. (7) Identify the Union Flag and know what to do when it is ‘broken’ and when the National Anthem is played. (8) Know a little about the characters and animals in ‘Friends of the Forest’. Four activity areas each containing 3 sections are the basis of the First, Second and Third Footprint badges. Each badge should take 4 to 6 months to gain and can only be gained once the Beaver has been invested. Each badge consists of ONE section from each of the activity areas to be take one section per month, in turn, from the four areas. The award of each badge is also subject to regular attendance at Colony meetings and activities. Scout Officers from the Beaver Section should incorporate the footprint badge activities into their weekly programmes according to their particular circumstances. The Forth Footprint Badge has a set syllabus. Note: Before any Footprint is awarded, the Beaver must be re-tested on Beaver Law and Promise. Handicrafts -Take part in an activity with Beavers in creative construction, drawing, painting or making things from scrap items. Collecting- Make a personal collection e.g. stamps, postcards or a joint collection with other members of the Colony. Safety - e.g. Safety in the home, water safety, Green Cross Code, safety in the street or park. Demonstrate a knowledge of any one of the above. Use of publicity material from RoSPA, COI, Local Government Public Safety Committee is to be encouraged. Physical Development- .Show an improvement in several skills involving physical effort e.g. games, sports, tying laces, fastening buttons. Social behaviour– Take an active and constructive part in the Colony activities, develop improved habits of cleanliness, tidiness, good conduct and show he/she can obey instructions and share with others. Help others– Understand the need to help other people by carrying out a special good turn either individually or as part of a Colony good turn. Nature study– Carry out an activity with the Colony in order to learn about some aspect of nature by practical means. e.g. study of animals, birds, insects, plants, flowers. Grow ‘coal ‘ flowers /seeds on flannel etc..
Expedition– Take part in an outing with the Colony where new or adventurous activities will be experienced, hike, ramble, visit to a museum, or other building of local or historical importance. Conservation– Understand the importance of protecting our environment and the damage that can be done by vandalism, litter etc., Take part in a project to clear litter or rubbish from a local area./ Cultivate a small patch of land as a garden or nature reserve/ Take part in a salvage collection for at least ONE month. Play Acting/ Miming– Learn to act or mime through engaging in a Colony activity which includes costume making, acting out a story/ Take part in a Scout-based entertainment on stage. ONE section from each of the FOUR ACTIVITY AREAS to be passed at the rate of ONE SECTION per month. Minimum time for badge—4 months. The sections used for this badge must be different to those used in the First Footprint. The sections used for this badge must be different to those used in the First and Second Footprints. Take part in a Colony good turn with an emphasis on your community by helping senior citizens (under supervision) or carrying out some work on a nature reserve or scheme to improve your neighbourhood. With the help of your Leaders, make contact with a Beaver Colony from another Area and find out something about their Colony. Ask if they will send you their Group Name Tape for your campfire blanket. (1) Visit the Pack and get to know his/her future Sixer and Akela. (2) Know the Wolf Cub Law and Promise. (3) Know the Wolf Cub Salute and Grand Howl and their meanings. (4) Know the Wolf Cub Motto. (5) Know a little about B-P and how Scouting started. (an extension of the Beaver investiture test). (6) Know about the Jungle Book and how Mowgli entered the Pack. Log badges have been introduced to recognise achievement whilst working towards the existing Footprint badges. For Footprints 1, 2 and 3 there are four activity areas; Learning, Developing, Exploring and Creating (formerly Discovering). 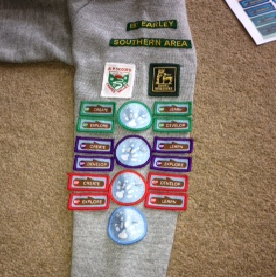 The Log badges are colour coordinated in line with the corresponding Footprint badge. The order of log badges within a particular footprint is immaterial. The idea is to gather logs as you work towards the highest award; the Dambuilder.